Johanna Konta and Kyle Edmund will carry British hopes on the opening day of the US Open on Monday. Edmund, ranked 85th, opens play on court five against France's 13th seed Richard Gasquet at 16:00 BST. Konta, seeded 13th, plays American Bethanie Mattek-Sands on the Grandstand court at around 00:00 on Tuesday. Novak Djokovic, Rafael Nadal and Angelique Kerber also play on day one, while Andy Murray is among six Britons scheduled for day two. The Scot, seeded second, will play Czech Lukas Rosol in the second night match at around 02:00 on Wednesday. Heather Watson, Naomi Broady, Laura Robson, Dan Evans and Aljaz Bedene complete the British singles contingent. Konta, 25, reached the fourth round last year but will face unfamiliar surroundings on Monday as she is among the first players scheduled to appear on the newly-constructed Grandstand arena. The Briton will also face a newly crowned Olympic mixed doubles champion, with home support, in Mattek-Sands. "She's playing inspired tennis," Konta told BBC Radio 5 live. "She's coming off the back of winning gold in Rio and it's no secret that American players do rise to the occasion in the US. They love playing at home." Edmund, 21, makes his debut in the US Open main draw and will take on former semi-finalist Gasquet for the first time. 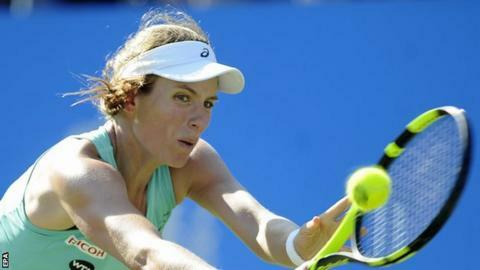 Former British number one Greg Rusedski believes world number 14 Konta can become the first GB woman since Jo Durie in 1984 to reach the WTA top 10. "It's something she will do by the end of the year," he told Sportsweek. Rusedski also believes that 2016 Australian Open semi-finalist Konta, who was ranked 146th in the world as recently as July 2015, has improved by working on her "mentality". "She hired a sports psychologist who works with hedge funders," said Rusedski. "He has put her into a process and a set of goals where she wants to achieve things and the process of doing things rather than focusing on results all the time, for Jo that is the right thing to do." Speaking of Konta's US Open prospects, Rusedski added: "I expect her to get to the round of 16. "If she gets a good draw, don't be surprised to see her back in the semi-finals of a Grand Slam again."